Now that the holidays and all their hustle+bustle are over, we’re settling back into our comfortable routine of weekly meal planning. Does that sound boring and all domestic-like? Perhaps it is, but I don’t mind – it keeps me from turning into an angry hunger-monster after work and ensures that our dinners are varied and, dare I say it, exciting. I made one of our dinners this week extra exciting by trying a brand-new recipe from the ever-inspiring Joni Marie Newman. I tested for her delightfully crafty Vegan Food Gifts book a year or so ago, and now that that book is released, she’s back in the culinary saddle again with plans for yet another cookbook. And once again, I’m helping test recipes for it. So exciting! I won’t spoil the theme of this book (trust me, it’s a good one), but I’m very excited about it. All the dishes I’ve tried so far have been jam-packed with flavor, helped in part by a multitude of brilliant from-scratch sauces and marinades. 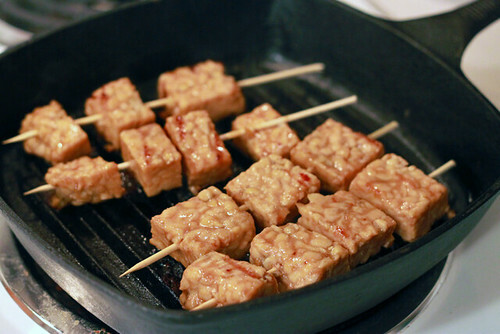 This week, I tried an orange-y marinade with some tempeh, which I then cooked on S’s lovely little cast-iron grill pan. These babies were also bathed in a citrus-y, garlic-y sauce that added even more flavor. I served some of the extra sauce over brown rice, and I even drizzled some onto my arugula side salad. Yum yum! Don’t forget to enter my cookbook giveaway by tomorrow (Sunday) night! I’m enjoying reading everyone’s exciting plans and hopes for 2013 – keep ’em coming! Yum. 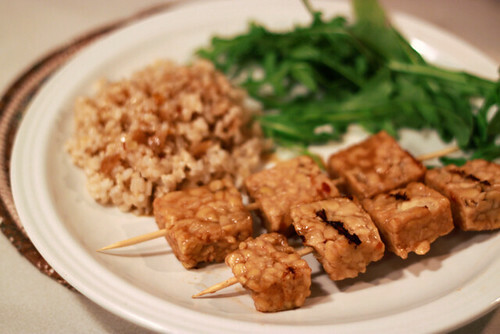 The tempeh looks tasty. I love that little cast iron skillet. Cast iron is on my to-do list for 2013. I’ve heard it’s amazing for cooking soy curls. I just found your blog and it’s great! I visited Madison for the first time last January and loved the Willy St. Coop and Green Owl Cafe. I’ve never tried soy curls on my cast iron! Great idea.